Movie lines come to mind, “You had me at Hello” and “awwww Venice”. It all started with a simple hello. A couple called us wanting information on Venice homes. This was the Thursday prior to Labor Day. David and Terri were considering relocating to the west coast (the best coast) from the other side. The other side of the state, that is. Their house was under contract and closing date was over 2 ½ months away. So, they thought it was probably time to look around. “We are in no hurry.” “Our closing isn’t until late in November. “ ”We are just gathering information.” they told us many times. They planned to spend Labor Day weekend in Venice and asked if Ray and I had time one afternoon to show them a few homes. Absolutely! That Saturday when they arrived we had scheduled about a half a dozen homes for them to look at and introduce them to The WEST VILLAGES communities. I had put together a packet of fun information about Venice. After looking at all the homes and exploring communities we had worked up an appetite; sunset dinner at Fin’s . awwww Venice! We had such a delightful time chatting. Terri & David shared they were high school sweethearts and work together in a home-based business. During dinner they decided they wanted to give a couple communities a second look. But, again, they are not going to buy, they are just looking. 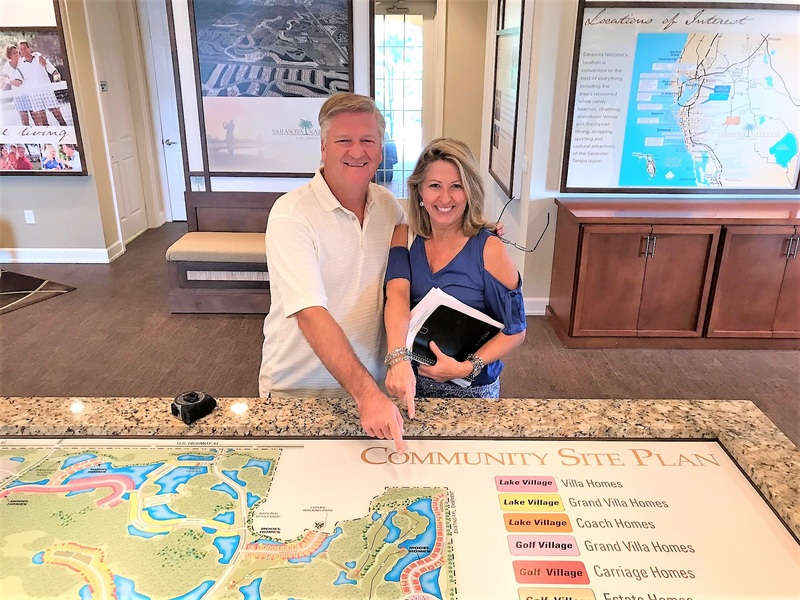 Sunday Ray and I both had Open Houses, so we arranged for them to meet with new construction agents at couple of the West Villages communities. One they particularly liked, Sarasota National, a wonderful golf course community with unbelievable amenities. Late in the afternoon they called Ray, “I think we found the one.” Wait, what? No longer just looking! But, you know how it is when you fall in love. “We will meet you there after our Open Houses.” Ray said. We met them at the “ONE”. & WOW! New construction model with smart design. It had just become available for sale. It was stunning and the view over the lake and towards the golf course simply incredible! It is 6:30 Sunday, Labor Day weekend, and we are making an offer on this new construction home! But, wait…No Way… there is another couple making an offer. We kick it into high-gear. Our offer is accepted. Now there are some details that need to addressed with our “kicking it into high gear” offer; details like- will David & Terri’s buyer be able to move that closing up a MONTH?! Holding our breath, their Buyer said YES! Oh and then the next weekend Irma blows through the state. Ray and I checked on their to-be home for them right after the storm. The home weathered Irma beautifully. And when David & Terri wanted to see for themselves all was ok post Irma, we met them there. Then we met again—at the closing table! Just 6 weeks from our initial Hello phone call of “We are just looking…” , to falling in love with Venice and Sarasota National, to owning a slice of paradise on the west coast of Florida. We met again that evening to sip a glass of champagne with them as we watched the sunset from their lanai. Ray toasted, “To the beginning of your next chapter.” Now, that’s a good day!